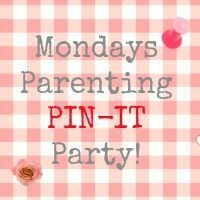 Last week, I had the pleasure of hosting the Parenting Pin it Party, and this week, we really do need to party with Mum of One, as believe it or not, it is actually our first birthday! Yeah to us – so there is even more reason to celebrate today. Well done and thanks to everyone who has joined in over the last year. We wouldn’t still be here if it wasn’t for all your support. You are fantastic; each and every one of you. Finally, please sparae a second to grab the badge below to pop on your blog. It’ll mean there are just a few more cheese balls to share around next time.